The Frugal Family Life: GE Energy Smart CLF Bulbs 3 Pack Only $.13 at Walmart!! 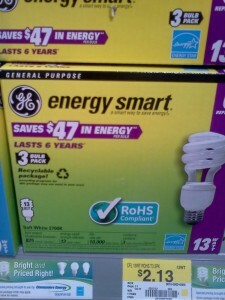 GE Energy Smart CLF Bulbs 3 Pack Only $.13 at Walmart!! Print this $2/1 coupon to get CHEAP light bulbs at Walmart!! Check out all the other Under $1 Walmart Deals here.